Although the tiltrotator concept is still relatively new to many in North America, contractors in the Nordic countries now consider it standard equipment. Thirty years ago, a product was born that would change an entire industry. Rototilt now celebrates a decade since the establishment of its own dedicated North American company based in Ontario, Canada. 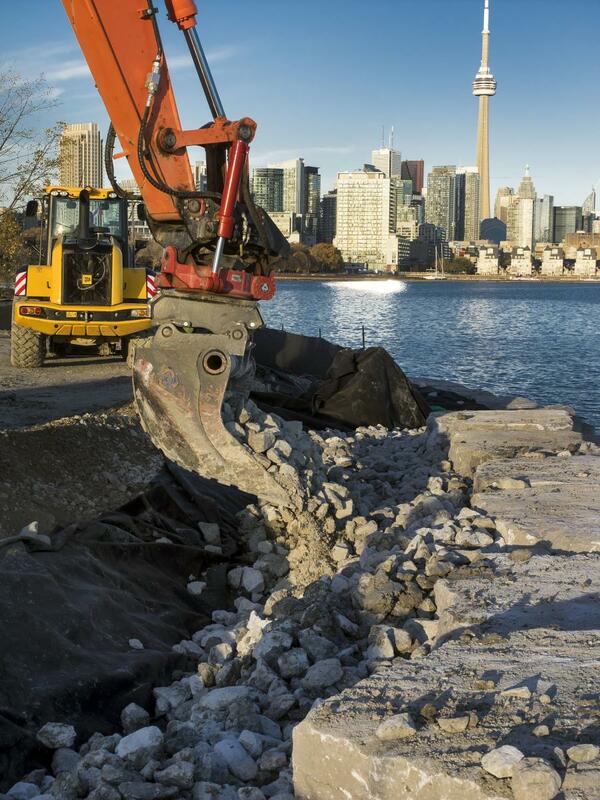 “It has been an incredible journey to promote a product that totally transforms excavators and how they work,” said Gerry Mallory, general manager, Rototilt Inc.
“When we started to gradually introduce Rototilt in North America in the late 90's, many people thought this was a product only for special applications or light duty work. We worked hard to convince contractors of the tremendous time and labor savings alone with a Rototilt equipment machine and why it was standard equipment in northern Europe, but it wasn't easy. Let's just say it takes time to change people's minds and how they work,” said Mallory. The interest and sales gradually emerged and in 2007 a decision was made to have a dedicated North American Rototilt daughter company to service and support the Canadian and U.S. markets. Rototilt Inc. was established in May 2008 in Brantford, Ontario, and now has an extensive inventory of Rototilt tiltrotators, accessory attachments and spare parts. “One of the more unique challenges was to get our customers to tell others or share about how the tiltrotator changed their way of working and made their operations so much more efficient. It was such a big advantage against their competitors, that they were very hesitant to share. It was almost like a secret,” said Mallory. The tiltrotator, which was given the name Rototilt by Rune Norgren at Noreco in Umeå, Sweden, was invented in the middle of the 1980s. His son Roger has worked with the product ever since. “It was my father, Rune, who decided that the product would be called Rototilt,” said Roger Norgren, who has seen the invention grow from a clever idea to a world-leading product. The name Rototilt — despite being a protected trademark — is often used as a generic term for the entire tiltrotator product category, such is its recognition. Rune saw the potential for developing this product concept into something big. The first tiltrotators were delivered to customers in the Umeå region of northern Sweden in 1986. At the same time, Indexator in Vindeln was looking for a possible complementary product to its rotator business. The rotator business at that time was primarily for the forest machine industry, and Indexator had one eye on the construction industry for new business opportunities. At this time, the financial system was in a very tough situation, and just like many companies during this period, Noreco got into financial difficulties. In 1992, Indexator had the opportunity to acquire the Noreco assets and purchased the product rights, the Rototilt brand and several technical applications. The CEO of Rototilt today, Anders Jonsson, remembers it had some tough times. The past 30 years with Rototilt have been characterized by innovation. Not just when it comes to the tiltrotator and its peripheral systems itself, but also the ideas surrounding how the tiltrotator can develop new opportunities for the construction industry. Two years ago the company name was changed from Indexator Rototilt Systems to just Rototilt. “We see an exciting, challenging potential in our new emerging markets like central Europe and North America where tiltrotators are still not used to the same extent as here at home, but where the market is developing step by step,” said Jonsson. Rototilt has the vision “One Rototilt on each excavator.” A number of OEM-partnerships are established with different machine manufacturers. “With Rototilt's world leading product quality and durability, along with our established and proven product support in North America, we are well positioned for the growing demand,” Mallory said.